Balakrushna Jani is the president of the Forest Rights Committee of Burlubaru, one of the Kutia Kondh (Particularly Vulnerable Tribal Groups) villages in Kandhmal district of Odisha. He narrates the story of how Kutia Kondhs in this village got titles on over 50 hectares (ha) of forest land in 2012-13 under the Forest Rights Act (FRA), which they have been cultivating since the time of their forefathers. But their happiness was short-lived as the forest department officials planted teak over their lands, soon after they received titles under the FRA. This meant that Kutia Kondhs cannot use the lands anymore over which they have rights for cultivation. The plight of Burlubaru is shared by many other Kutia Kondh villages where the forest department is continuing to forcibly plant commercial tree species in the land cultivated by them, including shifting cultivation land. In another nearby village, Paikpada, the department has cut down Sal trees from 25 ha, which falls within the traditional boundary of the village. The village has received rights for cultivation over part of the 25 ha and was almost through its claim-filing process over its traditional boundaries when the plantations were carried out. 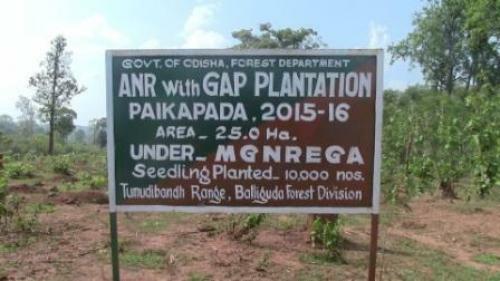 After carrying out the plantations, the forest department has been putting up boards to declare that the plantations have been carried out under CAMPA or MGNREGA. For instance, the board put up in Desughati village also reads that the forests classify as “PRF”, ie Proposed Reserved Forest; blatantly ignoring the fact that rights of the village have been recognised under FRA over these forest lands. Sal trees, which form an important source of livelihood for the tribal community, have been replaced with teak plantations. Labour for these plantations are being hired from neighbouring districts, as the Kutia Kondhs have decided to not lend any support to these plantation programmes. In another move, the forest department has installed CCTV cameras on the traditional lands of the community in Paikpada. Threats have been issued to the community against carrying out any cultivation activity on their own land, which if caught on the cameras, would lead to severe consequences for the Kutia Kondhs. This has left the community members terrorised. The forest department is of the opinion that shifting cultivation practices, which have been recognised as a traditional agriculture practice under the FRA, are destructive to the forests. The plantations are, therefore, being carried out in the name of regenerating “degraded” forests through afforestation. Several cases have been filed against the Kutia Kondhs for opposing forestry plantations on their lands. Some members of the community have been imprisoned as well. A series of plantation programmes have been launched by the government in the name of increasing tree and forest cover, regenerating degraded forests and also, compensatory afforestation. These include CAMPA, MGNREGA, Green India Mission and the more recently introduced Ama Jungle Yojana (AJY). There is massive funding for these programmes coming directly to the forest and other government departments, giving them powers to further carry out plantation programmes. In the case of Burlubaru and Paikpada, the plantations are being undertaken in gross violation of the FRA which recognises the rights over community forest resources and the customary habitats of PVTGs like the Kutia Kondhs. Community forest resources recognised under the FRA are treated as a new forest category to be governed and managed by Gram Sabhas of right-holding communities. The government is required to provide funds directly to the Gram Sabhas of the forest rights holders instead of the forest department. The forest department is not only violating the FRA through its plantation programmes, but is also doing so on lands which are only “proposed” to be notified as reserve forests on which it cannot claim the absolute powers it is asserting under the Indian Forest Act of 1927. The AJY programme is also facing resistance from communities. Hariharpur village in Deoghar district has recently filed a petition opposing implementation of the programme. AJY is a newly-launched scheme of the Odisha government being implemented with CAMPA funds and proposes to promote and strengthen the Joint Forest Management Committees, also called VSS, in about 7,000 villages located in 30 territorial and wildlife divisions of Odisha. As per government reports, at present there are more than 12,500 such committees, which are assigned protection and management of more than 11,68,000 ha of forests in Odisha. AJY is being widely opposed by forest-dwelling communities as it attempts to negate the statutory CFR rights of Gram Sabhas under the FRA by creating parallel institutions for forest management like the VSS. Like Hariharpur, many other villages in other districts have filed petitions against the scheme. The MoTA has taken note of the issue and has written to the state government to take necessary action. However, the forest department is continuing to implement the scheme across the state. Burlubaru and Paikpada are examples of how the plantation programmes are depriving forest-dwelling communities of their traditional rights, which have been recognised under FRA. Larger concerns have been raised about the implications of the Compensatory Afforestation Fund (CAF) Bill 2015, which will release huge funds of about Rs 42,000 crore to state forest departments to carry out plantations on a large scale. The Bill has been facing opposition from forest rights groups and civil society organisations for concerns like those mentioned above. The issue has come up in the Parliament where amendments have been proposed to make the bill compliant with the FRA provisions and to ensure the consent of the Gram Sabhas for any plantations to be undertaken with the funds. The bill is coming up again in the monsoon session of the Parliament. The CAF Bill and its possible enactment coincide with the tenth year of FRA’s enactment. Ironically, the Parliament which had passed the legislation to correct the historic injustice to forest-dwelling communities is going to enact the CAMPA Bill which is likely to have a detrimental impact on the forest rights of these communities, if the above concerns are ignored. It is, therefore, important that the concerns raised by communities and the NGOs on the implication of the CAF Bill on forest rights are taken up strongly in the Parliament.